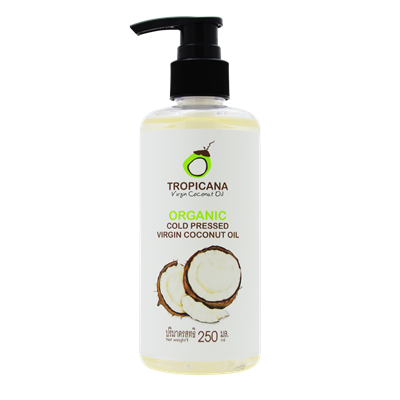 Cold press coconut oil 100% 250ml. Good for your healthy skin and hair, enriched Lauric Acid which is a ‘medium chain fatty acid’ which highly useful as an additional to form monolaurin inside the body of human. Lauric Acid is antibacterial characteristics and anti-oxidant. When it apply to your skin softly, it is non-greasy and hypoallergenic. Good for your healthy skin and hair, enriched Lauric Acid which is a ‘medium chain fatty acid’ which highly useful as an additional to form monolaurin inside the body of human. Lauric Acid is antibacterial characteristics and anti-oxidant. When it apply to your skin softly, it is non-greasy and hypoallergenic. Apply the skin after taking a bath for restoring the moisture, keeping youthful and anti aging result. Remove the cosmetics. Massage for soothing muscles. Keep your good scalp and anti dandruff by leaving in your hair 1-2 hours before shampoo for prevention of Anti-hair loss. 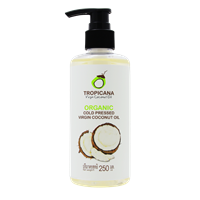 100% ORGANIC COLD-PRESSED VIRGIN COCONUT OIL 100 ML. 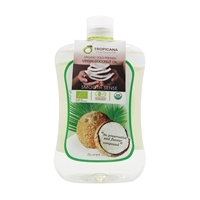 Organic cold-pressed coconut oil produced from special production technology by Tropicana Oil with non-refining process. 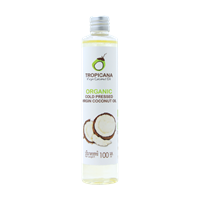 100% ORGANIC COLD-PRESSED VIRGIN COCONUT OIL 1000 ML. 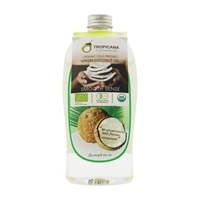 100% ORGANIC COLD-PRESSED VIRGIN COCONUT OIL 500 ML. Enrich with lauric acid, the fatty acid found in human skin. Which help effective skin peeling. For smooth and brighten skin, reduce wrinkle, naturally improve skin condition with Lavender oil make you energizing and relaxing every time you use. 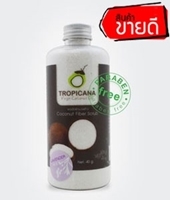 Copyright © 2019 Coconut Plaza น้ำมันมะพร้าวสกัดเย็น. All rights reserved.